Editor’s Note: This article, written by executive Director Bob Strodel first appeared in the recently released Fall 2016 issue of the Weathervane, CCCI’s newsletter. One of our many camp traditions is the annual 10-day trip down the Allagash Wilderness Waterway in Maine. (Did you know it actually flows north?) This 126 mile canoe trip started in 1972. From the beginning it was a special trip for a very unique reason, it was the FIRST co-ed trip at Camp Brookwoods and Deer Run. The Brookwoods and Deer Run camp experience back in the 1960s and early 1970s was very different from what it is today. The two camps were completely autonomous: separate eating schedules, separate program activities, separate swim piers, separate riflery ranges, separate tennis courts and no formal interaction between staffs. Mary Beth Bowling, the current Deer Run Director, recalls getting in trouble as a camper for speaking with her brother Peter on the front lawn after church one Sunday. The Craft Shop was the closest place for interaction, however the girls were limited to the ceramics side and the boys to the woodworking side. Life at camp was about to change. Ken Olson, a camp Dad in the 1960s and who later donated the 7,000 acres in Jackman, ME that became Moose River Outpost, was an avid outdoorsman. One day Ken spoke to Miles Strodel, the Brookwoods Director, about some potential trips in the Maine wilderness that would be great for camp. 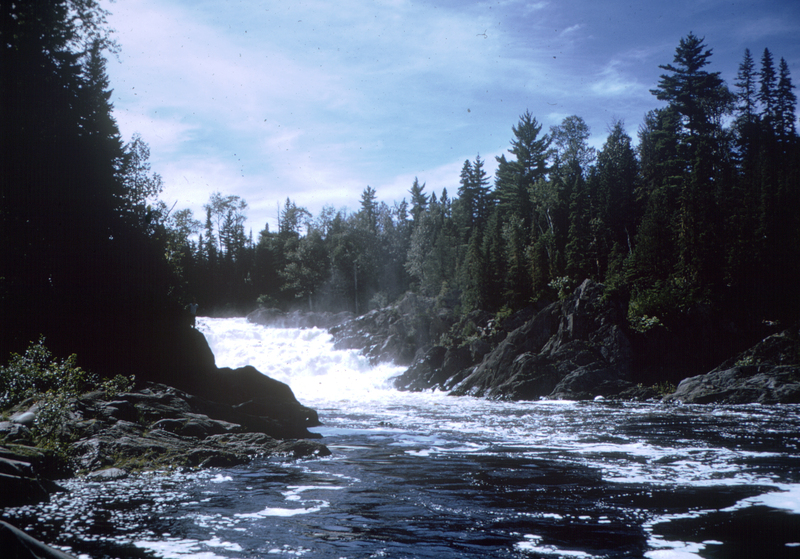 Uncle Doug Burke got involved and began to put together a canoe trip down a river, at Ken’s suggestion, that Camp had never explored: The Allagash. Bobbe Hackman, the Deer Run Director, asked Linn (Heaney) Bond and Tann Beasley to provide leadership from Deer Run. Linn was the lifeguard instructor and Tann the resident canoe instructor. Bobbe actually took them to the grocery store to buy food for the trip! Chris Roués was scheduled to be the fourth staff member on the trip, but the day before the departure he became sick and Uncle J.J. was asked to go in his place. Uncle Doug was in charge and he spent hours studying the map. It quickly became apparent that the amount of whitewater expected exceeded anything camp had previously attempted. In order to prepare, the Allagash group made a trip to the Androscoggin River for whitewater training. Hence, another tradition was established. We paddled to Chase Carry Rapids the next day on empty stomachs. Our Grumman aluminum canoes tended to “stick” on rocks and the majority of the group experienced some unintentional swimming, because they got out of their canoes to push off the rocks. Linn Bond recalls, “My best memory was when my canoe partner and I got hung up on a rock in the river and he jumped out. Freaked is more like it. I could not do it on my own, so I jumped out. The two of us washed down the river a ways. The canoe went head over heels down the river. It was scary! Fortunately no one was hurt.” With paddlers and canoes accounted for, we enjoyed “Tuna Wiggle” for dinner. “We didn’t know what was ahead” is the best way to describe the trip. Uncle Doug studied the map nightly. Several other groups were on the river at the same time and Uncle Doug quickly figured out that to secure decent campsites, early starts were required. We needed to beat the other groups. On the day we planned to camp at Allagash Falls, it became apparent that extreme measures were required. Uncle Doug strategically paired Bob Milaschewski with Jonathan Wilber; their instructions were to paddle as fast as they could. 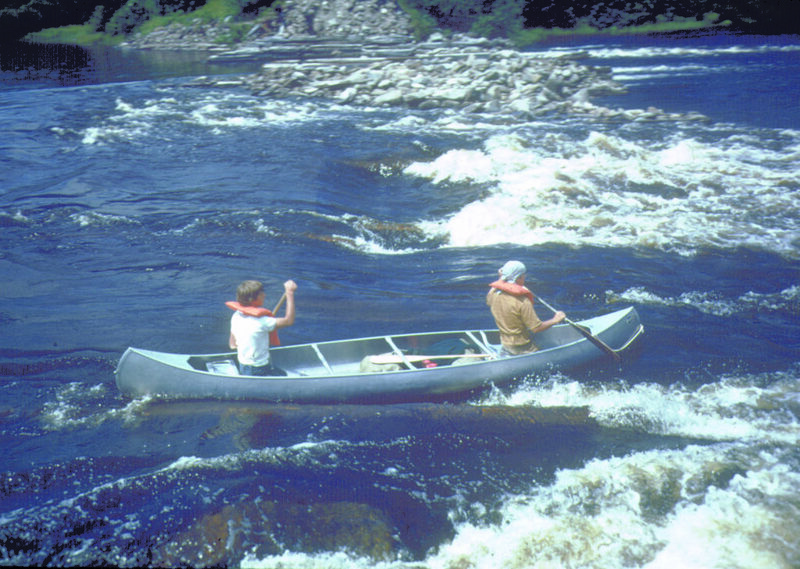 Their primary objective was to be the first canoe to arrive at Allagash Falls, racing against the other groups on the waterway. Fortunately, they were as fast as Doug had hoped and our group enjoyed a nice campsite that evening. As Allagash alumni can attest, Allagash Falls seems so much larger in person. The Falls look small in photographs, but the noise, mist, and volume of water cascading over the rocks is hard to describe and is best experienced in person. The trip ended in the small town of Allagash. We pulled out our canoes where the Allagash and the St. Croix Rivers intersect. Some of us picked up rocks from the riverbed; little did we know those same rocks would become a tradition (rock necklaces) decades later. Bob plans to write an historical overview of Camp, so if you have a story to tell, please email bob@christiancamps.net. No surprise, Bob’s two favorite trips were on the Allagash. The first trip because of the sense of true adventure and the second, several years later, because Bob and his dad, Uncle Miles, were canoe partners.